Location, location, location! 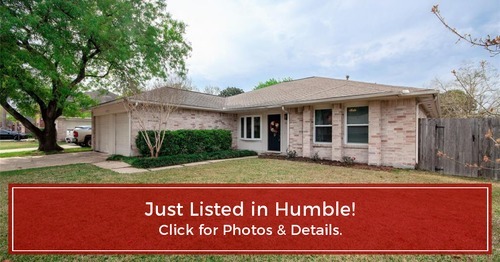 Lovely home sitting on large corner lot in Atascocita South just minutes away from everything you need! This home features FOUR spacious bedrooms! The family room is huge and features gorgeous laminate wood floors, tall ceilings and brick fireplace; spacious kitchen provides tons of cabinets and counter top space with breakfast bar, island and pantry. Refrigerator included! Dining room open to the family room is great for entertaining. Split floor plan; master suite is very spacious and includes its private bath with double sinks, huge walk in closet, linen closet and tub/shower combo; front bedroom has direct access into the second full bath which also features double sinks and tub/shower combo. Secondary baths are spacious and have a fresh coat of paint; fresh landscaping and gorgeous curb appeal! Great floor plan! Great price! Home is move in ready!